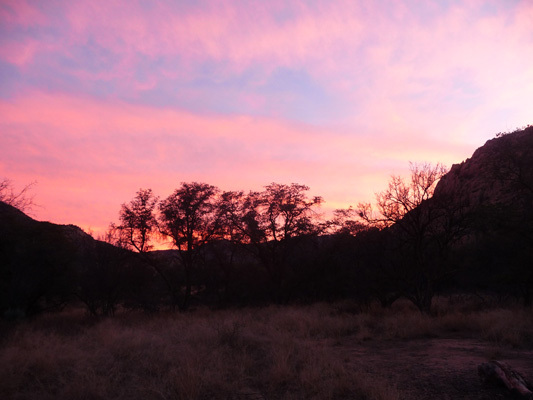 We arrived at Cochise Stronghold at mid-day on Friday February 13th. 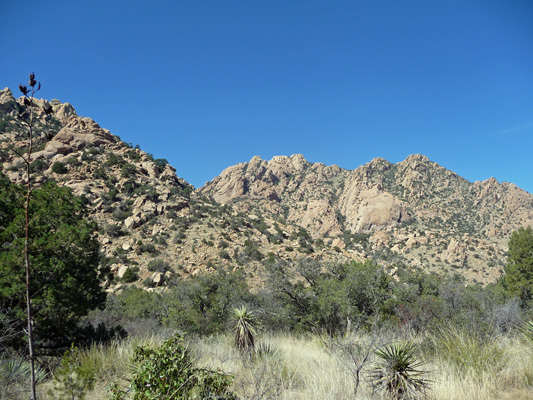 We set up camp and since it was a beautiful sunny day we headed back up the road to the Cochise Campground where the trailheads in this area all start. The campground was nearly empty and there was lots of day use parking available too. This is a really pretty campground but there’s no water and the road is pretty bad. So I guess that’s why it doesn’t get much use. It was even emptier when we were there on Saturday. The road out is dirt but the road through the campground is paved and each campsite has concrete curbing defining it’s parking area. Very uptown for the Forest Service Campground. We found a place to park, put out our Golden Age Pass to cover the day use fee and set out to find the Nature Trail. 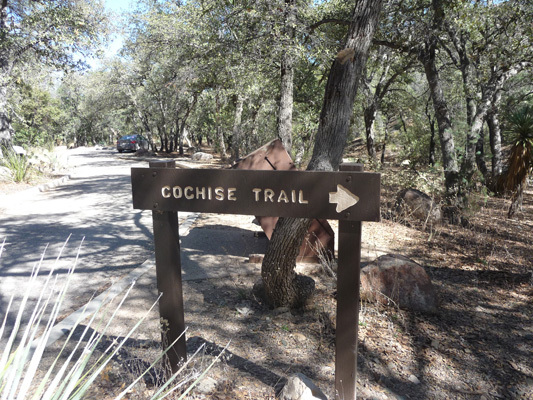 It starts at the same place as the Cochise Trail. It goes across a creek (currently dry) via a very large metal bridge and then continues on up the hill. There are nice metal signs informing you about the native plants and what the Chiricahua Apaches used them for. It also provides great views of the Stronghold itself. 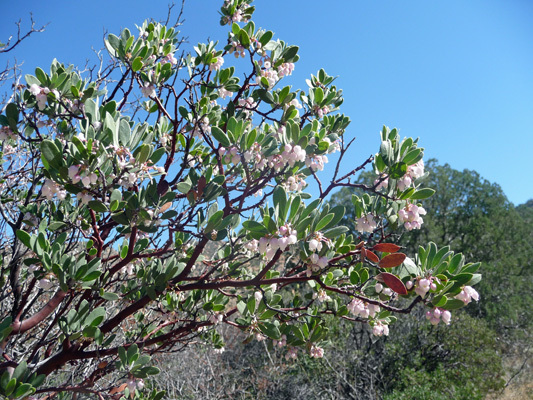 The manzanita was in bloom and the bees were busy visiting every little pink bell. 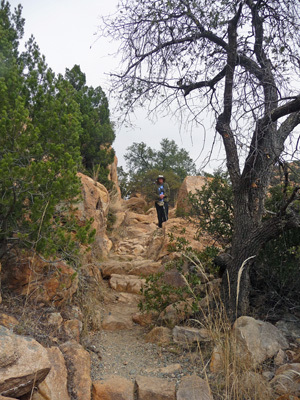 The trail winds up the hill via a series of steps and even provides a number of nice benches to rest on along the way. Again, this is a really nicely developed short trail—way nicer than most nature trails put together by the Forest Service. Someone got some funding someplace! 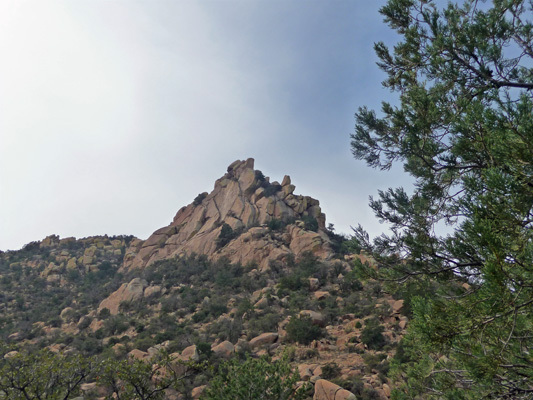 When we finished the loop we walked a little further along to the short Interpretive Trail that provides a great detailed history of the discovery and settlement of the Cochise Stronghold area, the history of the Chiracahua Apaches and Cochise himself. 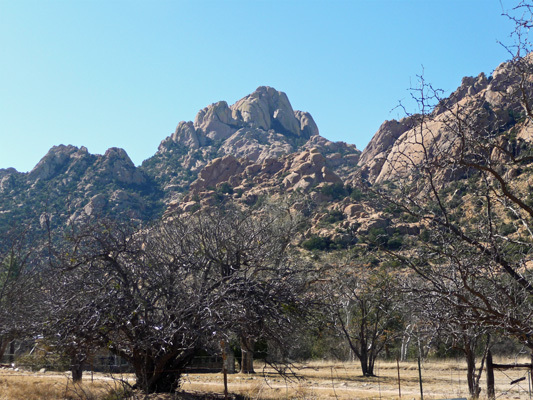 Cochise and his band lived in the Stronghold for about 15 years while at war with the US Army. They were not defeated once in that time because they could always see the army coming from where they sat up amongst the natural fortress in the rocks. On our way back to the trailer we stopped to read the history of settlement in the area. One of the first white settlers was John Rockfellow. They named this dome in the stronghold after him. That evening we had a nice low key sunset that just lit all of the sky up in nice pink and peach colors. 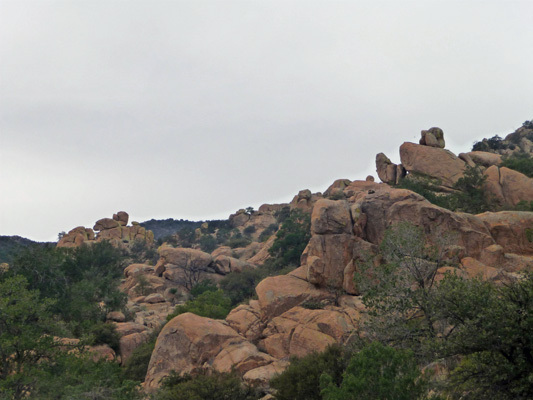 On Saturday February 14th (Happy Valentine’s Day), we drove back up to the campground to hike part of the Cochise Trail. 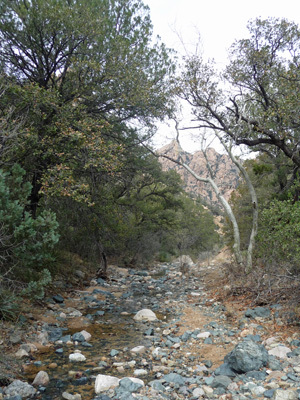 The trail winds up the canyon and across the creek (this one with water in it). There wasn’t a lot of water in it so hopping the rocks to cross it was no big deal. It winds through a forest of oaks and alligator bark junipers. And from time to time you get a nice view of the Stronghold. It was partly cloudy and the sun was playing hide and seek as we hiked. It didn’t take long before I took off my fleece. 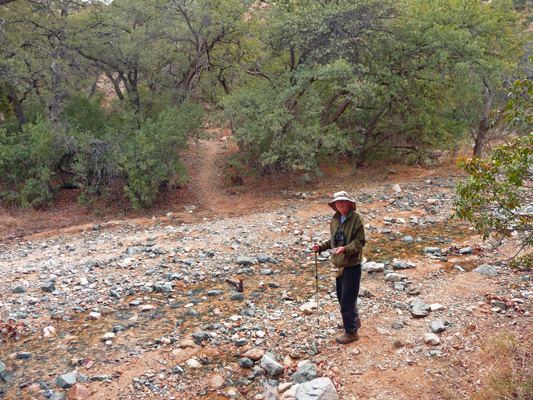 The trail is very rocky and uneven and climbs steadily following along the creek. We saw more Mexican Jays and a couple of towhees and a hummingbird. Along with more views of the stronghold. At one point we went through a grove of huge alligator bark junipers—they’re the tallest junipers that grow in Arizona. And I took this shot of the bark so you could see it. It really does look like alligator hide. 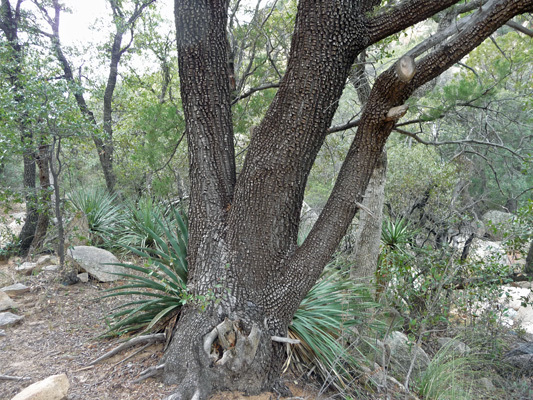 There are two or three kinds of yuccas and agaves that grow here along with the oaks and junipers. We crossed the creek again. And wound up the hill to a great view of balancing rocks. 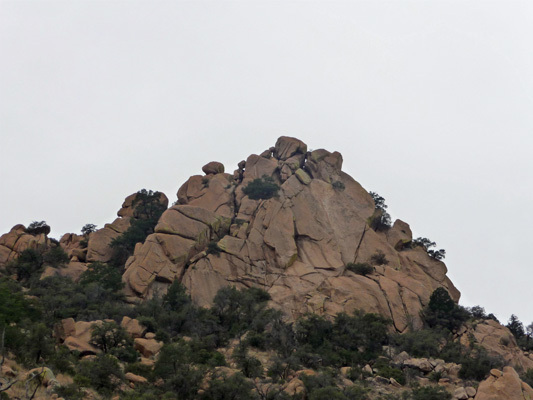 The rock here is granite, not the volcanic tuff that we saw at Chiricahua National Monument. 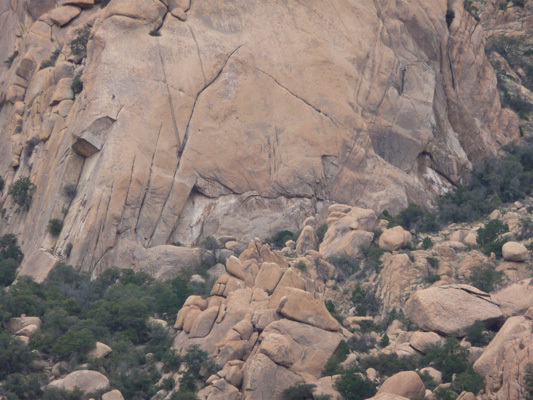 So these formations are more like the ones we saw at Joshua Tree National Park. 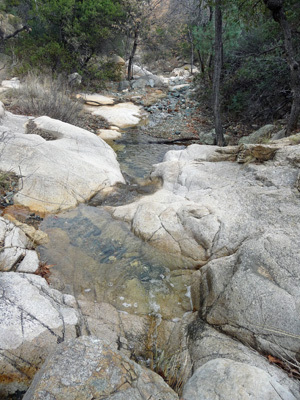 After a mile of steady climbing you come to Cochise Spring. Doesn’t it sound lovely? Well, it’s not real special, just a metal-lined box to catch water as it arises from the ground here. There are really about 3 springs—witness the mud in the background. But the creek is really pretty here. 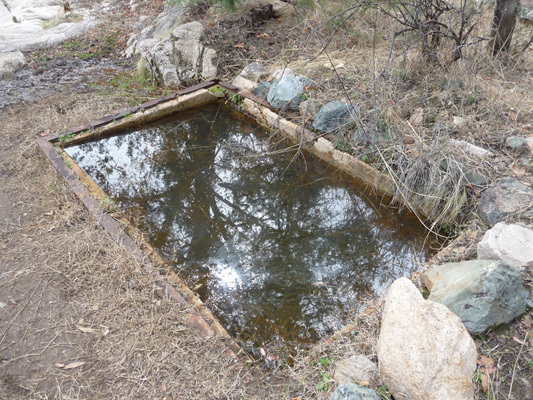 There are a set of natural bowls that might be great fun to play in in hot weather—but the creek might be dry then. Sitting here enjoying the shade and resting before we hiked back, Walter noticed there were still folks hiding in the rocks and shot this photo. In fact, it’s not hard to imagine there being all sorts of ‘hostiles’ hiding behind the rocks all over the place here. We headed back downhill but of course first we had to climb a ways up these natural stairs. It’s a rocky trail with a bit of rock scrambling here and there. 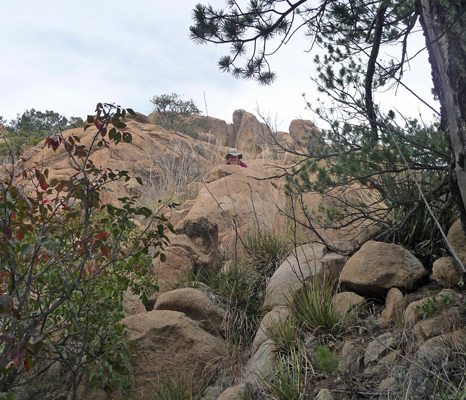 At this point, we’ve both got a lot of cardio fitness but lots of rock scrambling and uneven ground still causes us some problems. But the views were worth the scramble. When we got back to the Nature Trail we stopped to take out the binoculars to see if there were any climbers on this sheer rock face. There are hundreds of popular rock climbing routes here and we saw a number of climbers setting out when we first arrived that morning. It’s a bit of a hike and a scramble just to get to this rock face. But sure enough, we spied 2 climbers tethered together and climbing. One is just above the big notch on the left. The other is about halfway up the right hand side of the notch. We sat and watched them for a while and then went on home for a quiet afternoon. Sunday we took the day off. We did a few chores and walked the road out to make sure we understood all the hazards. And in the late afternoon we hustled out and brought the solar panels in when we had a bit of a rain shower. Now the truck looks really dirty since its coating of dust is now rain spattered. 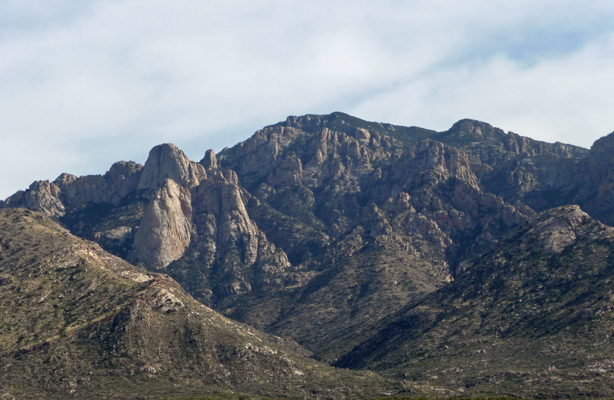 Monday morning, February 16th we motored 90 miles northwest to Catalina State Park just north of Tucson. We had a repair appointment for the Airstream on the 17th in Tucson, so we decided to stay for a few days at one of our favorite parks while we were there. We’d not had a lot of spots to choose from when we made our reservations here (this campground is pretty much full from January through mid April) but we won the jackpot the first night with a spot with a great view out the dining room windows. I got distracted talking to some folks in a really marvelous aluminum teardrop trailer and forgot to take a shot of the view before it got dark. So in the morning, right at sunrise I took this shot before we headed off to our 9 am Airstream appointment. Those are the Santa Catalina Mountains to the southeast. We had this lovely green field, the mesquite and the mountains for our view. 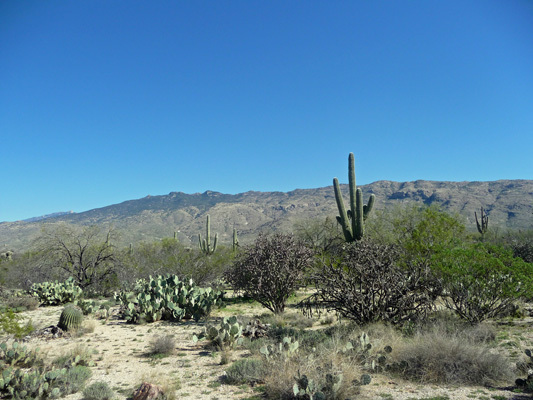 While the Airstream was having her repairs, we did errands (Trader Joes, Whole Foods and Walmart) and when she still wasn’t ready we took a drive over to the eastern section of Saguaro National Park on the east flank of Tucson. There’s a nice 8 mile drive through a section of the park that also has a bunch of trails that lead off of it. So we set out to drive the loop. This is the view looking north. Tucson is so beautiful because it’s surrounded by lovely mountains. 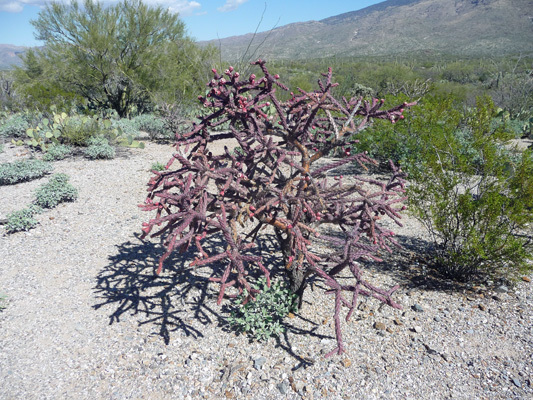 I spied this gorgeous purple buckhorn cholla with deep red fruit! This is a pretty classic shot of the area. Especially if you toss in a big saguaro. 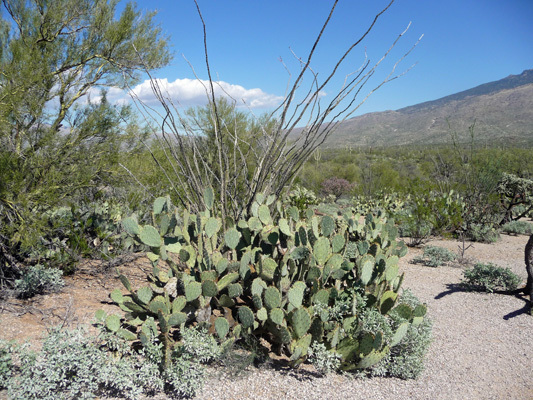 There are lots of big clumps of Engelmann Prickly Pear. 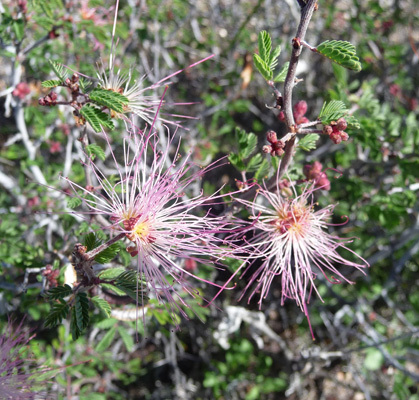 And there were tons of fairy dusters (Calliandra eriophylla) in bloom. We still had a couple of hours before we needed to pick up the Airstream, so we stopped to do a short hike into the desert. 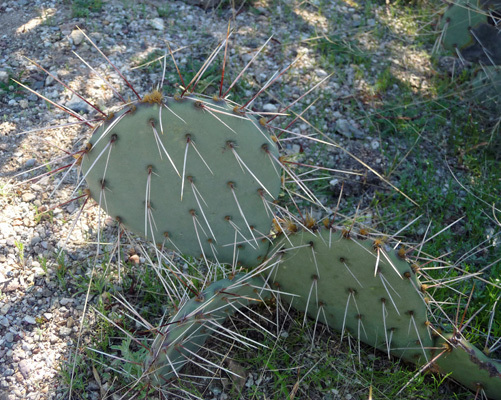 I spied this brown spine prickly pear and had to take a photo because of the size of its spines. Don’t trip and fall on that baby! 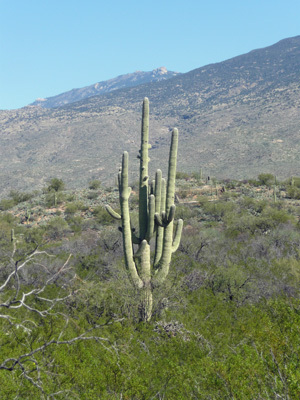 It was a lovely landscape of staghorn cholla, prickly pears and saguaros with the Rincon Mountains in the background. 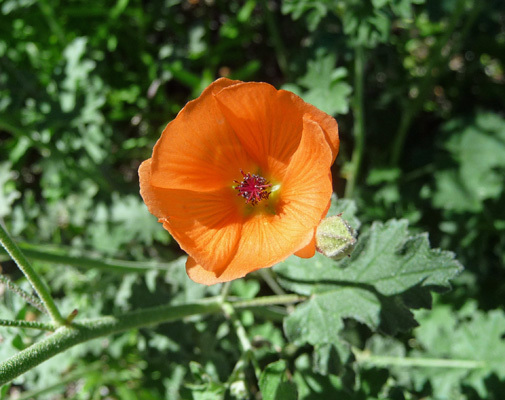 Down in Tucson itself there were lots of things in bloom but here in the park (where it’s a bit higher) there were only the fairy dusters and this globemallow (Sphaeralcea laxa). A few minutes later Walter’s phone rang. It was the Airstream folks with the news that our Airstream had never been registered with the corporate warranty office. We needed to call our dealer in Covington, WA and get it straightened out and then maybe they’d consider letting us have our trailer back. So we high tailed it back to the truck; dug out the appropriate phone numbers (which we were lucky to have with us) and made some calls. Then we drove across town to the Airstream dealer. The warranty thing got handled (at least to their satisfaction we’re still not sure how it got messed up) and we got Genevieve back safe and sound late in the afternoon. 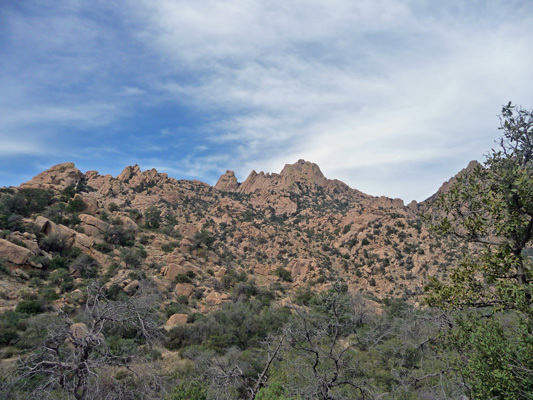 We drove back up to Catalina State Park to our new spot (not as nice a view but lots of space around us), unloaded all the groceries we’d bought and stowed them away and collapsed for the evening. I went out to take a shot of the late afternoon sun on the mountains and got side-tracked talking to the maintenance hosts who were walking by when I stepped out to take the photos. Arizona requires a 6 month commitment from there hosts for this very popular park! And there are no sewer hookups. These folks clean the bathrooms and mow the weeds here and have been here since August. Thanks but no thanks, we’ll take a pass on this one. The next day, we did ‘regular’ grocery shopping at the local Safeway and made some phone calls that we needed to make for appointments when we return to the Seattle area at the end of April. After two days of errands and ‘taking care of business’ it was nice to have a quiet afternoon. 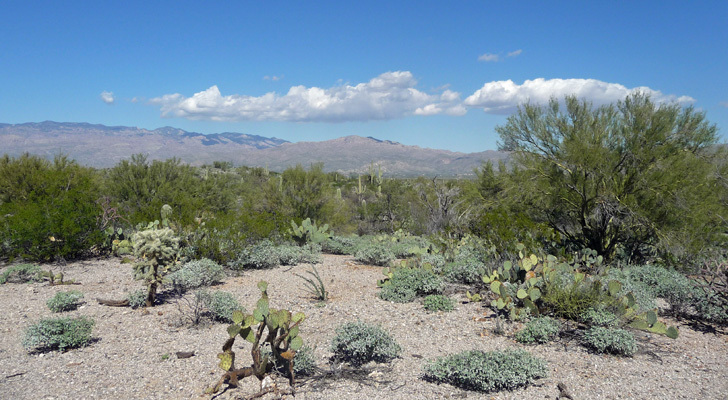 I did managed to get a decent panorama shot of the view to the southeast from our picnic table. 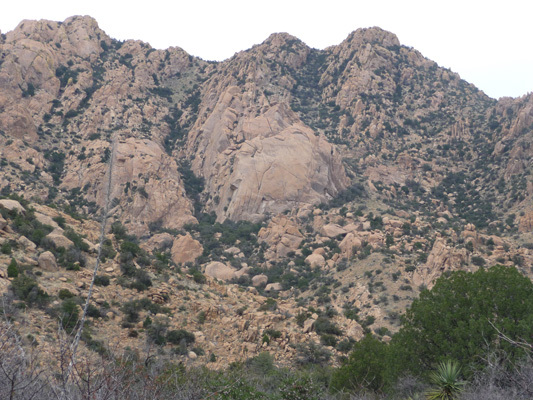 Here’s a close up shot of my favorite peak in the Santa Catalinas. 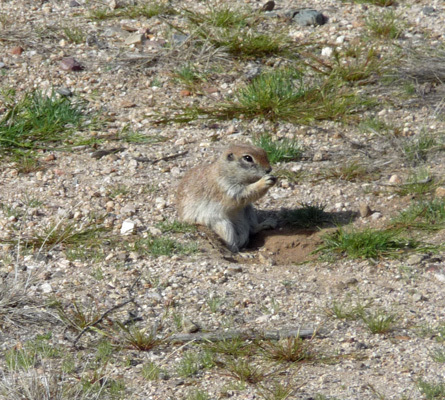 The entire campground is home to a large number of prairie dogs. Here’s one of our neighbors partway out of his hole. That evening we had dinner with our old housemate, Deborah Schifter, from our years in community in Massachusetts. She visits Tucson most winters and finally we got to see her when we were both here at the same time! It was wonderful to see her and spend time with her—almost as if all those years hadn’t passed in between!